The latest study in Dylanology, Rolling Thunder and the Gospel Years, is a sometimes rambling, but mostly engaging, 4-hour magnum opus about the world of Bob Dylan. This “totally unauthorized” documentary starts off with a 25-minute interview with Rubin “Hurricane” Carter, the subject of Dylan’s song Hurricane. Oddly enough, the interview does more to spike interest in Norman Jewison’s movie about Carter, with Denzel Washington in the title role of The Hurricane, than in Dylan’s music itself. Part of the problem is that, as with Gilbert’s other Dylan documentaries, the program does not contain any Dylan music because of licensing constraints. Gilbert’s work would be much stronger if he was allowed to back it up with actual Dylan music. Indeed, the non-stop, non-Dylan background music supplied by Gilbert and many of his interviewees becomes grating after a while. That said, this is still a solid look at Dylan’s work and influences. While it is a little rough around the edges, this is actually the kind of programming MTV and VH1 should pursue instead of their embarrassingly awful stabs at reality TV that do nothing more than make a lot of former icons look foolish. 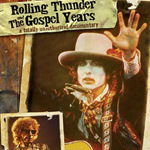 Rolling Thunder and the Gospel Years is a significant improvement over Gilbert’s previous two Dylan documentaries and far more ambitious. While World Tour 1966: The Home Movies was myopic and nearly intolerable, World Tours: 1966-1974 upped the ante by expanding the scope, but both suffered from Gilbert’s inherent goofiness. What the heck? It was a nasty crime indeed, but that brief, trivial moment with the kids should have been clipped since Gilbert chose to skirt the issue anyway. The “Hurricane” Carter interview is followed by a half-hour on the recording of the album Desire, before moving on to Dylan’s Rolling Thunder Revue and then his Gospel years. The documentary is strengthened by participation from such Dylanites as Scarlet Rivera, Claudia Levy, Jerry Wexler, A.J. Weberman, Ramblin’ Jack Elliott, and Rob Stoner (who, irritatingly, sits indoors and never, ever takes off his Ray-bans while being interviewed for this documentary). Dylan’s Rolling Thunder Revue was a traveling musical carnival that Stoner describes as something “wilder and more off the cuff” than previous Dylan tours. The shows featured Dylan in white face paint, which Dylan said was to force people to listen to his words rather than spend time looking at his face. Ego problems and other changed dynamics during Leg 2 of the Rolling Thunder Revue dampened the carnival atmosphere. As fate would have it, Colorado featured prominently in Dylan’s history yet again, this time with Fort Collins playing host to the final performance of the Rolling Thunder tour. The show was delayed for days on end because of non-stop rain and the concert ultimately produced the Dylan live album entitled, appropriately enough, Hard Rain. The documentary also features some good stories about Dylan’s Clinton Prison performance. (Yes, people actually tried to break into the prison to see Bob perform!) As the fates would have it, “Hurricane” Carter was moved from a prison in Trenton, NJ, to the all-female Clinton complex because of all the publicity his stay in the Trenton “hellhole” was generating. It was a fairly bizarre, historic moment that brought together female black inmates, white folk music, and Joni Mitchell having a very bad day. Mitchell, who turned out to be the least popular act at the gig, got booed and she in turn, shockingly, afterward told off “Hurricane” Carter, as if the crowd’s reaction was under his control. One topic rolls into the next, including Renaldo & Clara, a “Felliniesque” curiosity, to put it mildly, starring Dylan and Joan Baez with some scripting by Sam Shepard. From there, it’s time for the Gospel years, which includes interviews with Pastor Bill Dwyer, of Vineyard Christian Fellowship Church, and others who offer some interesting insight into what made Dylan tick while he recorded his next album, Slow Train Coming. Overall, this is an immersive presentation, not a lot of background information is given to set up the various interviewees or subjects for the uninitiated. Dylan’s fans will do fine and fill in the blanks on their own, but the uninitiated will no doubt fidget often during the DVD’s 4-hour sprint. Rolling Thunder and the Gospel Years definitely paints a picture of Dylan, the man and the enigma, without Dylan’s own participation. Is the end result a Pollock? Maybe a Degas? Well, it’s most definitely post-modernist Gilbert. The extras here are worthwhile and essentially constitute more of the documentary, simply presented separately. The two main features are an 11-minute featurette on Gilbert’s visit to Hibbing, Minn., Dylan’s hometown, as well a 13-minute interview with Ramblin’ Jack about his early days in the music business. There’s also a photo gallery, which unfortunately does not offer a step-frame feature. The program is essentially presented in 1.85:1, although some content is further cropped. It’s not enhanced for 16x9 screens, but the video presentation fits the material. The 2.0 stereo soundtrack is also serviceable and, given this is a documentary without the benefit of Dylan’s own music, it works.